Aside from the production credits, which I’ll get to shortly, there are two very important things to know about Blood-C. The first is that it is frequently a vehicle for gruesome violence. In fact, much of the violence in the version I saw was censored out, so it is possible that the final version (when it is released on disc) will be even more shockingly gory. The second thing to know is that, although I described Blood-C as a supernatural fighting anime above (and it is), the series is built as a mystery or riddle. This has frustrated some viewers, so it is important to know when going in that there is something wrong, and the major thread of the story is the mystery of what is going on. I personally enjoyed this aspect of the series. It is clear from the beginning that something is not right, because there is too great a contrast between the daily activities of Saya and the townsfolk, and Saya’s nighttime battles against supernatural beings. I read many comments online by people who immediately jumped to the meta-level, claiming that the show was unrealistic because the contrast between night and day was too great. 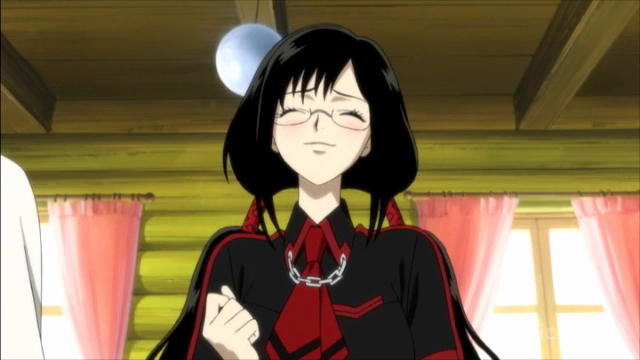 If you choose to watch Blood-C, and feel that there is something wrong, welcome that feeling. That is your intellect telling you that you have discovered a clue in the mystery. Blood-C is a short series (12 episodes), and it really is the story of Saya eventually discovering the truth behind that mystery. As you might know, Blood-C is the product of several creative forces. First there is the heritage of the Blood universe. Secondly, there is the legendary company Production I.G., and third the creative nexus known as CLAMP. Production I.G. is famous for having animated many excellent series, including shows that featured great action sequences, such as Ghost in the Shell. CLAMP are the creators of many of the most famous manga/anime in recent decades (from Cardcaptor Sakura to Code Geass). To some extent I think this combination of creative forces was unfortunate, in the sense that Blood fans are not necessarily CLAMP fans, but from my perspective, we got a very stylish concept and character designs (CLAMP), joined with one of the best production companies, that really knows how to deliver action sequences (Production I.G. ), set in a gory, supernatural universe (Blood). I personally think this combination worked, but CLAMP haters have vocally declared otherwise. Should you watch Blood-C? As suggested above, there are a few things to consider, do you want to not see gruesome violence? 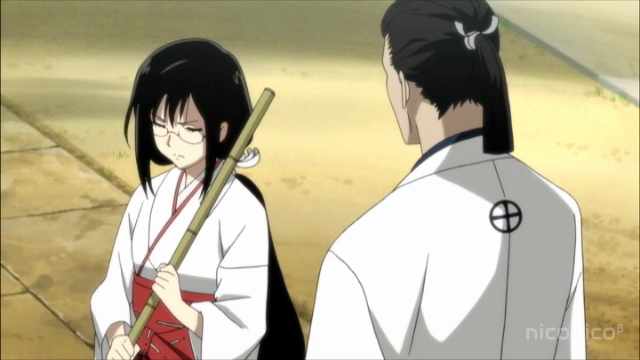 Are you inclined to be dissatisfied with the slow build-up as the mysterious world around Saya is presented? Do you hate CLAMP character designs? If so, hey, there are other shows you could be watching. 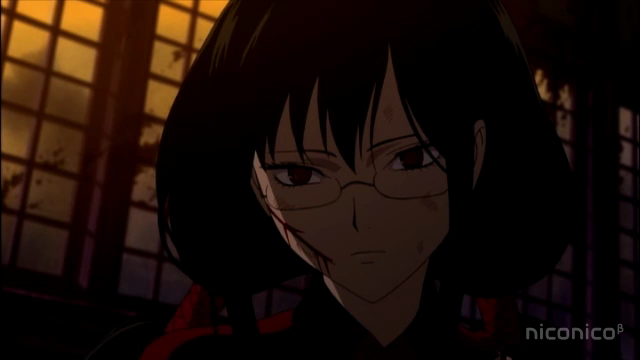 Blood-C isn’t my favorite show of all time, or even of those that ended in Summer 2011. On the other hand, I really did enjoy it. It has an unusual approach to story-telling that can put people off (a kind of “two steps forward one step back” style), but that is inherently tied to the riddle of the world Saya inhabits. It has several very good action sequences (including an impressively animated fight in the final episode). The gory violence was not something I would have sought out, but it certainly added to the shock and horror, as well as to the confusion about what is really going on. It is difficult to comment on characters in a spoiler-free review, but it certainly is fair to say that some characters undergo significant transformation before the series ends. Finally, a movie for Blood-C has been announced, and some might be checking out this review to determine if they should watch the TV series before watching the movie. I certainly am looking forward to seeing the movie, and anticipate that my watching the TV series first will be a great help in understanding certain things, but I haven’t seen the movie yet, so I can’t say that I know that this information will be required. REMINDER: Please refrain from posting spoilers in your comments! If you want to discuss spoilers, go to the post I made for the final episode, instead. I guess I may have misjudged this show based purely on its first episode, which was pretty ridiculous – I was putting a show off for executing exactly what it was trying to do (use ridiculousness as a clue). I might get to this this season, when I don’t plan to watch as many shows. I don’t know – I don’t think I’ve seen a show that seems to be similar to the Blood-C you present in this post before. It is unusual, and kind of gutsy. Unfortunately they clearly lost some viewers as a result. I do not mind the guts of this series. I like enigma but initially that enigma is ill represented and all we can do is brace ourselves or hope for the best. As a show that took a week to air this lag obviously would frustrated many viewers — unlike Ghost In The Shell and even FullMetal Alchemist the show scarcely touching on its own connotative specialities making it feel drab. I like the town it was presented in and I also liked some of the slice of life moments but it did have shortcomings and until the last episodes can be pretty much fast forwarded or ignored. Yeah there seem to be three camps: those who say the whole thing isn’t worth it, those, like yourself, who think some, most, or all of the early part can be skipped, and those, like myself, that think there was a real purpose to the earlier portion. in truth the anime as a whole is WAY WAY WAY too gory but was pretty good nontheless. i would like to see the movie but id REALLY like to see a second season of this because season 1 ends in a giant cliffhanger pretty much. maybe the movie will be like a second season but idk for sure. It would have been nice to have less mystery and more storyline but i guess thats part of the storyline lol. it does seem to have alot of filler scenes(probably why the fighting ones are sooo gory to make up for it) and the constant emotional rollercoaster that is Saya does get alil annoying. unless shes “Super Saya” then shes just badass and doesnt give a damn :D.
Other then those few(in my opinion) faults the anime was pretty good and id recomend it but i still think its not something id want a 12 yr old watching ya know. I don’t know what they have planned for the movie, but I am looking forward to it. I don’t think it really is a cliff-hanger ending, though. There are some things left open, but I think the main story-line was completed (I don’t want to say more than that to prevent spoilers in this thread), and nobody is in immediate danger at the very end. It is more like a “wow, imagine the possibilities” ending. Clearly there are stories still untold in this universe, and we have the movie (at least) to look forward to. Oh, and I agree, it is pretty graphic in terms of violence, and I wouldn’t want to subject a little kid to it. They have enough troubles with learning Math, and making friends. No need for them to have their heads filled with gruesome violence. Just to remind you that aside from Concept Character Design, CLAMP had nothing related with Geass. Okay. My point there was really to indicate the range of shows they have worked on, not to relate Geass to Blood-C in some significant way. If you have only a few episodes to go, it is IMO really worth finishing. This is a back-loaded series. As to the censorship, maybe some people would have enjoyed watching the disc releases more. I think it turned out well. The gory violence was clearly over the top, but that is what it is. I think there is a tension between CLAMP and Production I.G. that was very fruitful. CLAMP seem to be more interested in very stylish design properties, and I.G. know how to handle gripping, realistic action sequences. Those two things can be in tension, but as a result here was pretty effective. I’m REALLY hoping they can get a good budget for the movie, because that will help them deliver the best of both worlds. Yeah I didn’t address any of that because I never saw any of the previous Blood shows. It’s pretty interesting that they are that willing to change it up. I wouldn’t want all shows to be like that, but having a show like this where they are willing to make big changes in style and setting is pretty exciting.